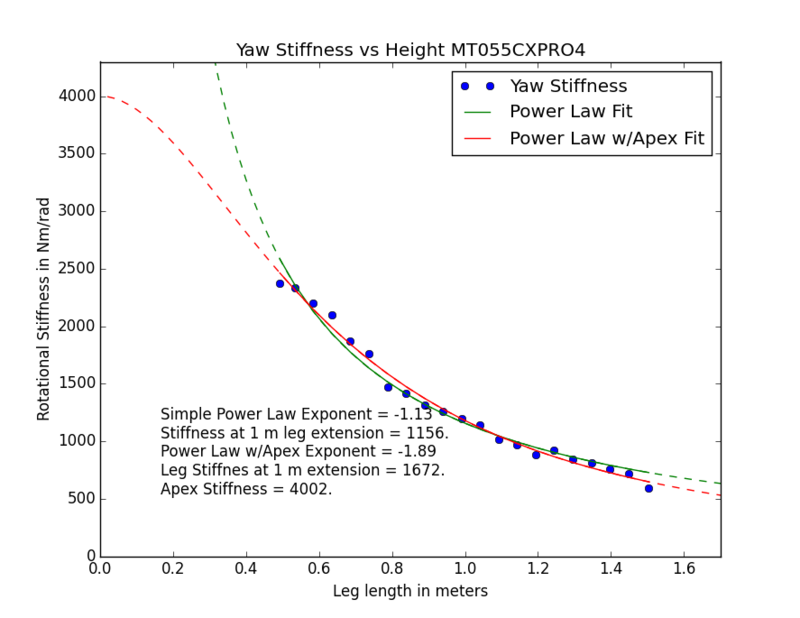 In a previous post, I tested the stiffness vs. height for the Manfrotto MT055XPRO3 tripod, and found that to get a good fit to the data, I had to include a term that accounted for the finite stiffness of the tripod apex. Using a simple power law was not enough to fit the data well. 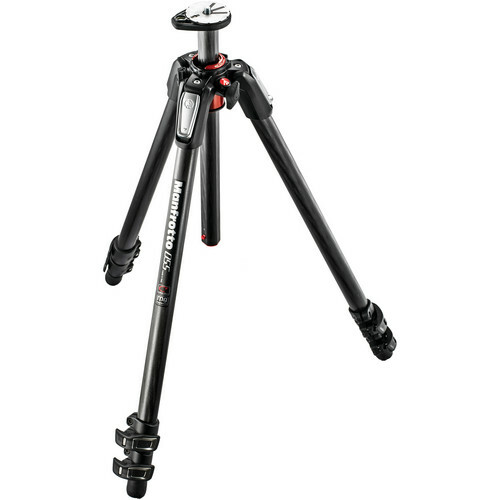 This brought up the question of how the other, very similar Manfrotto 055 tripods would behave under the same test, and that is the subject of this post. I will be discussing the models described in that post in the context of the new data presented for these tripods. As before, we can see that including the term for the finite apex stiffness significantly improves the appearance of the fit. This is particularly evident at the edges of the data set. The MT055CXPRO3 is identical in construction except for the use of carbon fiber in the legs and center column. The results are rather similar. Because the stiffness starts out a lot higher at max height, the carbon version shows a much flatter curve. The apex stiffness plays a larger role. The apex stiffness is lower than I expected, but still within ballpark of the aluminum version of the tripod. Take the exact numbers for the fits with a grain of salt. There is a lot more error with these parameters when compared to fitting the tripod resonance frequency in the individual stiffness tests. There is also significant covariance between parameters in the fit. By this I mean we could obtain a nearly equally good fit by raising the apex stiffness slightly and lowering the magnitude of the power law exponent slightly. This would make it look much more similar to the aluminum version in behavior. I am not reporting the errors here, because to do a full error analysis would require the entire covariance matrix for the fit, which is beyond the scope of this article. Just take the numbers as approximate. The power law exponent is around -2, not exactly -2.16. The data for the four section MT055CXPRO4 is remarkably similar to the aluminum version. 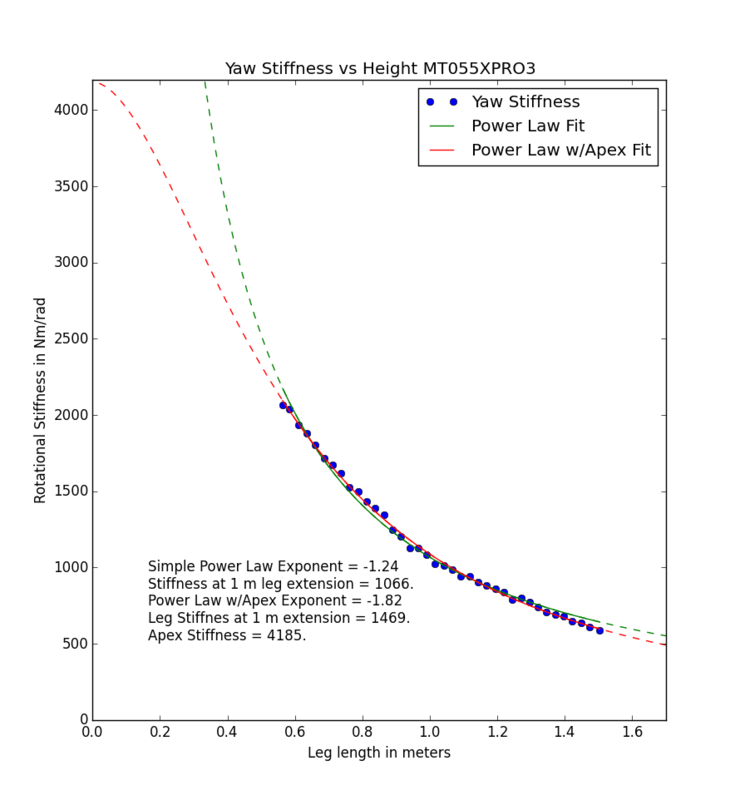 The apex stiffness for both is right around 4000, and the exponents are incredibly similar. Again, the stiffness is a little bit higher throughout, so the curve is flatter, and more similar to the other three section carbon version. Based on this data, these fits seem to give a ballpark estimate of the apex stiffness and how much it impacts the stiffness of the tripod overall. 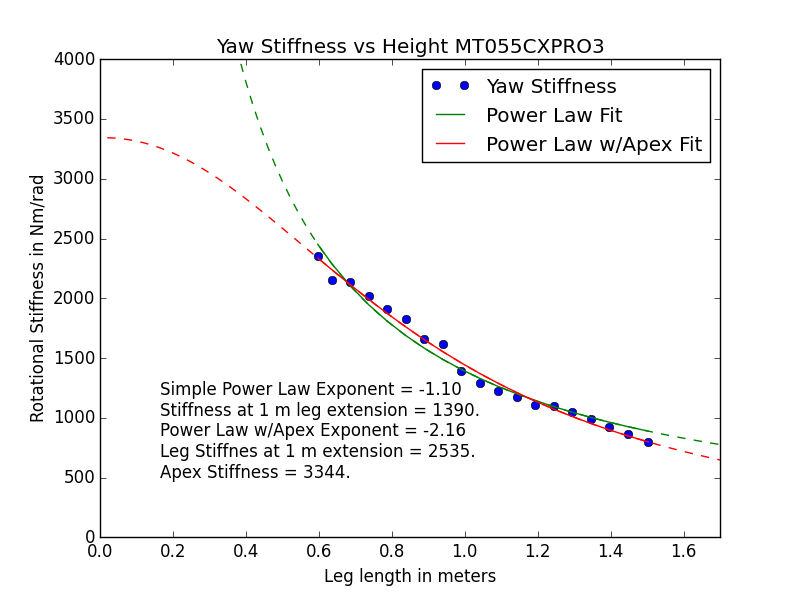 The exponent for the leg stiffness vs height seems to be hovering right around -2. Given that the least stiff bottom legs of the tripod collapse first when reducing height, we should expect that the exponent for a tripod with a single leg section to be lower in magnitude, say between -1 and -2. While such a tripod of course would be impractical, it forms the basis simple modeling of tripod behavior. Basic beam deflection formulas typically assume that the beam is of constant stiffness, which multi-section tripod legs clearly are not. These data definitively rule out any model with an exponent of -3, and most likely ones with an exponent of -2 as well. Tests of stiffness vs height for more tripods is forthcoming, and eventually a discussion of a deflection model for tripods.